Puzzle toys inspire a dog's natural food-seeking instincts. By hiding bits of food or treats in each of the puzzle's compartments, you encourage your dog to work for their meal. Not only does this slow down fast-eaters, but the mental stimulation is incredibly beneficial to your dog's emotional well-being. However, puzzle toys can be expensive, and it's just a matter of time before your dog figures it out and gets bored with their new toy. By participating in the AAPS Puzzle Club, your dog can enjoy all of the benefits of puzzle toys, and won't experience any of the downsides! 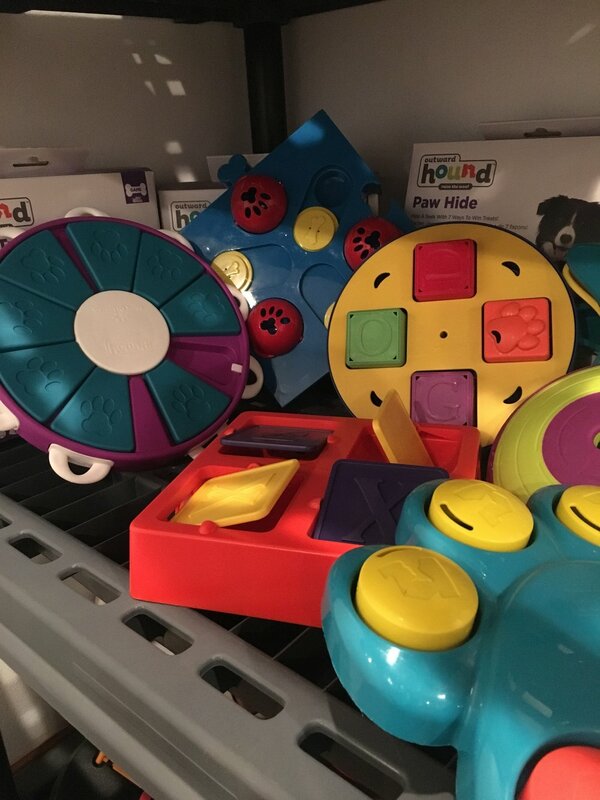 For $35 a year, you will have access to our library of puzzle toys, available for checkout at our Training Center & Resale Shop. Toys will be thoroughly sanitized by our staff in between checkouts. Puzzles can be checked in and out during training hours. Access to the Puzzle Club is included in our 4 and 6 month training memberships. To join the AAPS Puzzle Club, visit us at our Training Center or email us at allaboutpetservices@gmail.com.